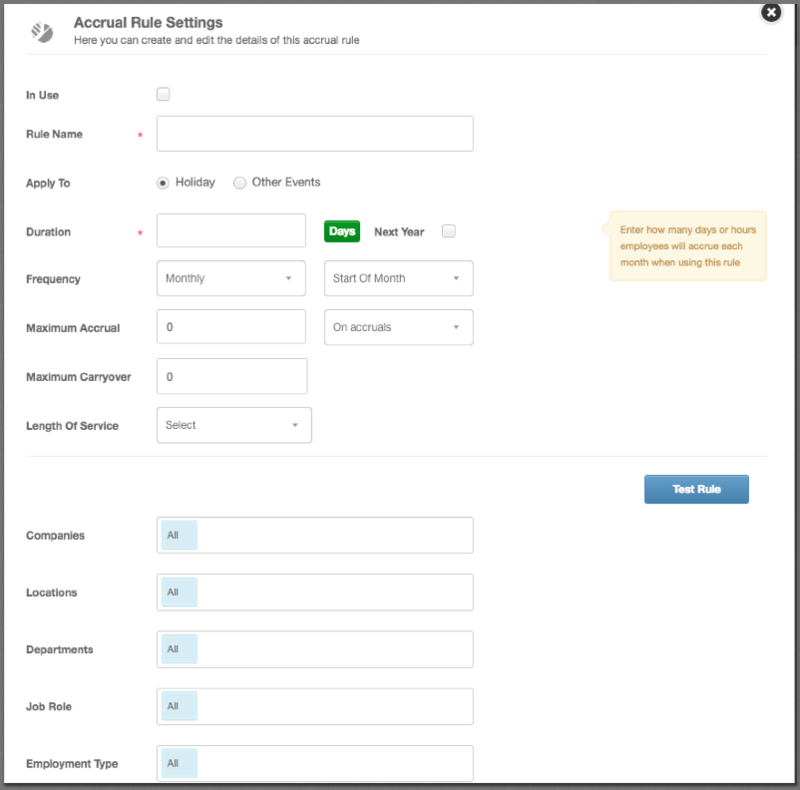 (Admin Only) Learn how to set up PTO / accrual rules for your employees. 5. Select 'In Use' if you wish to make this rule live straight away. You may wish to leave this off if you are doing this task in advance. 8. Specify how many days or hours an employee would accrue per month. You can select whether you wish for this to be added on the first or last day of every month. On accruals - The value you enter is the maximum that the employee can accrue, not their maximum entitlement. Using the example above, if they already have entitlement before this rule was added, they can accrue 20 extra days above what they already have. On entitlement - The maximum amount will take into account the entitlement that the employee already has. For example, if they had 3 days and was then added to the rule, they will be able to accrue 17 more. On remaining balance - The employee's entitlement will pause when they hit their maximum amount, 20 for example. If they then book 5 days holiday, they are able to accrue another 5 until they are back up to their max. 20 is the maximum value an employee can have remaining at one time. 10. You can also specify a maximum carryover rule - how many they are allowed to automatically carryover at the end of the year if they have any remaining. 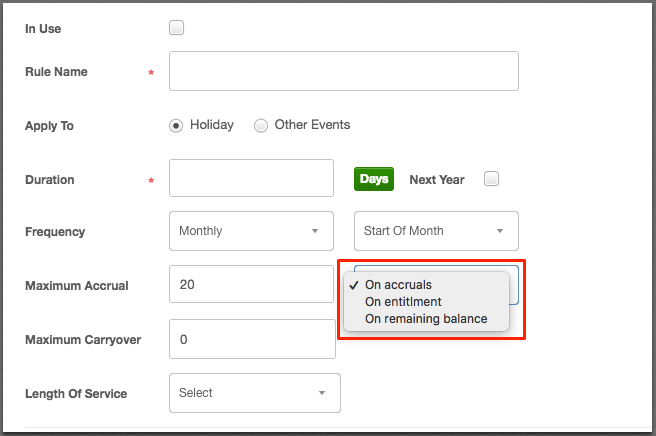 If an employee is assigned to this accrual rule, this is the carry over rule that will take affect for the employee - not the default carryover rule you will find in your Holiday & Absence Settings. 11. The Length of Service drop-down box is to specify anyone with that has worked greater than, less than or in between a certain amount of months who will be assigned to this rule. For example, anyone who has worked greater than 3 months will be assigned, and therefore excluding anyone in their probation stage. 12. You can also filter by Company/Location/Department. Or include, or exclude, specific employees.